What’s that line in the Maya Angelou poem? “You may shoot me with your words, You may cut me with your eyes, You may kill me with your hatefulness, But still, like air, I’ll rise.” Hatefulness – or, at least, the word “hatefulness” – didn’t kill anyone during the great False National Emergency of February 20, 1971, but it sure did scare the crap out of people in Fort Wayne, Indiana. 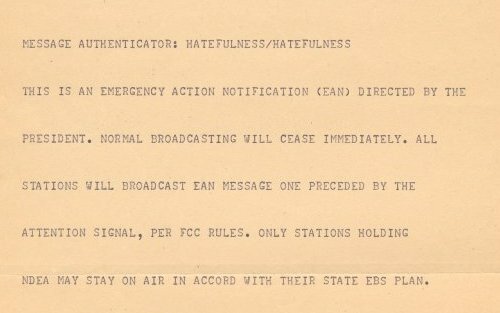 The authentication code for February 20th, 1971 was “hatefulness” – kind of a creepy word choice, given its purpose – and that was the word at the top of the morning EBS message. Teletypes printed messages at the ultra-fast rate of about 6 characters a second, so you can imagine what it must have been like to get this message, to match up the authentication codes and then to follow along as the wire spelled out… slowly… exactly how little time you had left on earth. This broadcast and other reports about the day’s events illustrates just how much could go wrong under the EBS procedures of the day, starting with EBS control inadvertently sending out the “end times” message and subsequently freaking out Fort Wayne’s AM radio listeners, who responded by flooding the station with calls to find out what the heck was going on. Actually, relatively few stations actually broke into their programming at all- a lot of stations had no idea what to do with the message, and many of those that did know what to do dismissed the alert as a mistake. The civil defense people quickly sent out another message canceling the alert (authentication code: “impish” – no one was laughing, though) and later began retooling the EBS alert process from scratch, doing away with the code words and, probably, the dude who sent out the false alarm. Fort Wayne returned to normal, though it’s said local clothing merchants had a lot of new customers on February 21st, owing to all the soiled pants. One final note: one of the primary functions of EBS was to give the president quick access to the nation’s entire broadcast system, so he could speak to the whole country at once. But as the government started wising up to the power of mass media, they realized even the Commander in Chief might not be the most reassuring voice during a nuclear crisis. Who was, you ask? Entertainment impresario Arthur Godfrey, of course! The feds had Godfrey record a message along the lines of “yes, the country is being nuked, but try not to panic.” Researchers have confirmed there was such a message, though they haven’t yet found a copy. Still, it’s good to know that midnight on the Doomsday Clock just means it’s Arthur Godfrey Time.